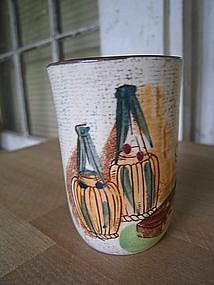 Vintage pottery tumbler manufactured in Japan. It is 3 3/8 inches in height and holds 6 ounces. There are no chips, cracks, breaks or rough rim, but does show minor crazing. 3 tumblers are available and priced individually. I need your zip code to calculate the postage.